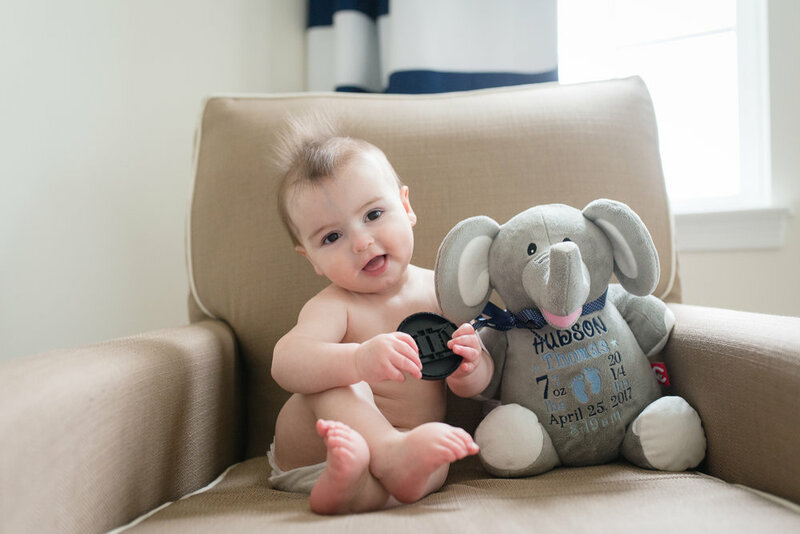 Hudson Thomas: 10 Month Time Capsule — Northern VA Newborn, Maternity, and Family Photographer serving Ashburn, Leesburg, Purcellville, & Loudoun Co.
-Naps. Well, they are better. I think. You didn't really love the past few months without your swing for naps, but you are starting to turn the corner to Nap Town. You will take naps sometimes and sometimes they are long, but mostly they are catnaps with lots of fussing. But, catnaps are better than nothing. On bad nap days, we still have to put you in the car and have affectionately started calling this little tradition called "Donuts & a Drive" because we hit up the drive-thru at Dunkin' and pick up some donuts while the big girls watch a movie in the car. This month, we have had fewer 'Donuts & Drives' so you are getting better and better at sleeping in your crib for naps! Keep it up bud! -The biggest news this month is that you started crawling a few days after turning 10 months old! This is HUGE because the doctor was starting to worry that maybe you were a little behind with your gross motor skills. In fact, we had to have you evaluated for Early Intervention for this very reason. You really crammed for the test because just a few days before the meeting, your mommy was certain that you were going to have to receive a little therapy to get you caught up but then BOOM!- you took off!! Two of my favorite parts from the evaulation report were that you: (1) understood the word 'no' when I said it, but that you stopped, smiled, and did it anyway and (2) that you enjoyed feeding puffs more to the dogs than to yourself! haha, both so true. You still don't like to roll, but oh well, we will work on that. Now Mommy and Daddy have to Hudson proof the house because you love to get into things that you aren't supposed to. -You got three more teeth this month! ALL AT THE SAME TIME (explains a lot!)! Your smile looks so different now, but is just as adorable! -Speaking of teeth, you don't really like to use them on food yet, but you are taking more and more solids and have a strong preference for fruits...and a strong dislike of vegetables in any form. You have put a few puffs and crackers in your mouth and are starting to kind of enjoy them...kind of. I'm hopeful that next month we will be writing about how you are using those cute little chompers to eat lots of table food! We are trying to teach you how to use a cup and a straw as well! -One of my favorite things about you right now is your fuzzy hair! It is growing at a fast rate and sticks straight up...just like your big sister Lila who sported quite the fuzzy mohawk when she was your age. We love you and look forward to see what month 11 looks like! only way I could get him to sit still was to give him my lens cap!! Lila Faith: Three Years Old!